Over 100,000 ounces of gold were claimed on delivery yesterday at the bargain price of 1,209.80. That bring the total ounces taken in the first few days of the June gold 100 oz contract delivery to a record 878,400 ounces. The big takers are a JPM mystery customer and their house account, and the house account at Nova Scotia. But in all reality this is relatively peanuts compared to what the 'exceptionally well-informed' were able to make on the movements in the bond markets this morning, given the size and leverage of the position in that casino. And a casino it surely has become. But every little bit helps when one is attempting to sustain the unsustainable. 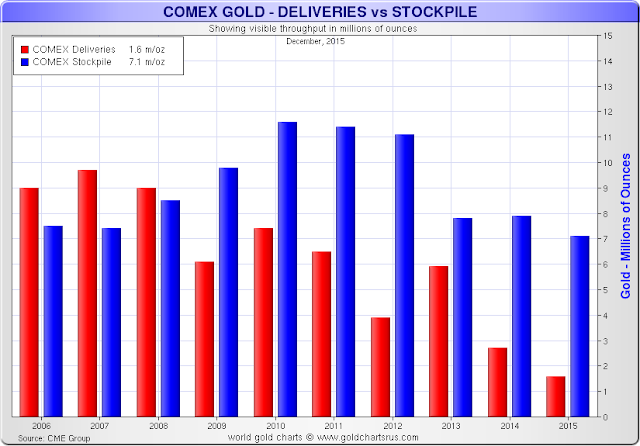 In the second chart I show the annual deliveries of gold in ounces on the Comex. So for example, in all of last year there were about 1.5 million ounces delivered. The blistering pace we are seeing now reminds one of the type of action that we were recording prior to gold's big move higher starting around 2006 when the central banks changed from net sellers to net buyers. The big price movements in physical gold and silver are yet to come I think.